The jobs numbers were indeed bad last week. Only 36,000 new jobs in January, and unemployment fell because people were giving up. Famous DC caught the wonderful appearance of Congressman Jesse Jackson Jr who felt the situation called for a demonstration of illusory magic. 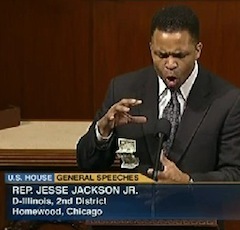 I applaud Mr. Jackson’s showmanship, but really, we don’t need magic tricks in Congress, we just need some damn jobs.